With the publication in 2012 of Coming Apart: The State of White America, 1960-2010, political scientist Charles Murray – celebrated and denigrated in equal measure for his earlier works, Losing Ground (1984) and The Bell Curve (1994) – produced a searing, searching analysis of a nation cleaving along the lines of class, a nation, as he put it, ‘coming apart at the seams’. On the one side of this conflicted society, as Murray sees it, there is the intellectual or ‘cognitive’ elite, graduates of America’s leading universities, bound together through marriage and work, and clustered together in the same exclusive zipcodes, places such as Beverly Hills, Santa Monica and Boston. In these communities of the likeminded, which Murray gives the fictional title of ‘Belmont’, the inhabitants share the same values, the same moral outlook, the same distinct sense of themselves as superior. And on the other side, there is the ‘new lower class’, the white Americans who left education with no more than a high-school diploma, who increasingly divorce among themselves, endure unemployment together, and are gathered in neighbourhoods that Murray gives the title of ‘Fishtown’ – inspired by an actual white, blue-collar neighbourhood of the same name in Philadelphia. It is in Fishtown that the trends Murray identifies as the most damaging over the past 50 years – family breakdown, loss of employment, crime and a loss of social capital – are felt and experienced. Its inhabitants have a set of values (albeit threadbare ones), an outlook and a way of life that are entirely at odds with those from Belmont. And it is between these two almost entirely distinct moral communities, that the new Culture Wars now appear to be being fought…. Collins: I was thinking about how, in Coming Apart, you explore how the elites seek to distance themselves from the working class. They eat so-called healthier foods, they have different child-rearing practices, and so on. Then, from afar, they preach their preferred ways to the working class, as if they know better. The elites may no longer preach traditional civic virtues, as you note in Coming Apart, but they are still preaching, in a way. Only now they’re preaching about health, parenting and other things. Murray: They are preaching. They are legislating. They are creating policies. The elites (on both the right and the left) do not get excited about low-skill immigration. Let’s face it, if you are members of the elite, immigration provides you with cheap nannies, cheap lawn care, and so on. There are a variety of ways in which it is a case of ‘hey, it’s no skin off my back’ to have all of these new workers. The elites are promulgating policies for which they do not pay the price. That’s true of immigration, that’s true of education. When they support the teachers’ unions in all sorts of practices that are terrible for kids, they don’t pay that price. Either they send their kids to private schools, or they send their kids to schools in affluent suburbs in which they, the parents, really do have a lot of de facto influence over how the school is run. So they don’t pay the price for policy after policy. Perhaps the most irritating to me – and here we are talking about preaching – is how they are constantly criticising the working class for being racist, for seeking to live in neighbourhoods in which whites are the majority. The elites live in zipcodes that are overwhelmingly white, with very few blacks and Latinos. The only significant minorities in elite zipcodes are East and South Asians. And, as the American sociologist Andrew Hacker has said, Asians are ‘honorary whites’. The integration that you have in elite neighbourhoods is only for the model minority, not for other minorities. That’s a kind of hypocrisy, to call working-class whites ‘racist’ for doing exactly the same thing that the elites do. It’s terrible. they had constructed a model, a mathematical argument, for calculating the average surface temperature of a rocky planet. Using just two factors — electromagnetic radiation beamed by the sun into the atmosphere and the atmospheric pressure at a planet’s surface — the scientists could predict a planet’s temperature. The physical principle, they said, was similar to the way that high-pressure air ignites fuel in a diesel engine. It seems to me that their real sin was contradicting the “settled science” of climatology. In the list of President Obama’s favorite things to do, using government power to save the world from human-caused “climate change” has to rank at the top. From the time of his nomination acceptance speech in June 2008 (“this was the moment when the rise of the oceans began to slow and our planet began to heal . . .”), through all of his State of the Union addresses, and right up to the present, he has never missed an opportunity to lecture us on how atmospheric warming from our sinful “greenhouse gas” emissions is the greatest crisis facing humanity…. But is there actually any scientific basis for this? Supposedly, it’s to be found in a document uttered by EPA back in December 2009, known as the “Endangerment Finding.” In said document, the geniuses at EPA purport to find that the emissions of “greenhouse gases” into the atmosphere are causing a danger to human health and welfare through the greenhouse warming mechanism. But, you ask, is there any actual proof of that? EPA’s answer (found in the Endangerment Finding) is the “Three Lines of Evidence”…. The news is that a major new work of research, from a large group of top scientists and mathematicians, asserts that EPA’s “lines of evidence,” and thus its Endangerment Finding, have been scientifically invalidated…. So the authors of this Report, operating without government or industry funding, compiled the best available atmospheric temperature time series from 13 independent sources (satellites, balloons, buoys, and surface records), and then backed out only ENSO (i.e., El Nino/La Nina) effects. And with that data and that sole adjustment they found: no evidence of the so-called Tropical Hot Spot that is the key to EPA’s claimed “basic physical understanding” of the claimed atmospheric greenhouse warming model, plus no statistically significant atmospheric warming at all to be explained. What an amazing non-coincidence. That’s exactly what I found when I looked at the temperature record for Austin, Texas, since the late 1960s, when AGW was supposedly making life miserable for the planet. See “AGW in Austin? (II)” and the list of related readings and posts at the bottom. See also “Is Science Self Correcting?” (answer: no). The National Academies of Sciences, Engineering, and Medicine have just released what can fairly be described as the most comprehensive look at the economic and fiscal impact of immigration on the United States. It represents an update of sorts of a similar NAS study released in 1997, in the middle of an earlier immigration debate. Overall the report is quite balanced, with a lot of interesting findings…. The most straightforward part of the study is its assemblage of estimates of the current fiscal impact of immigrants. The study shows that immigrants (legal and illegal) do not come close to paying enough in taxes to cover their consumption of public services at the present time. The NAS present eight different scenarios based on different assumptions about the current fiscal impact of immigrants and their dependent children — and every scenario is negative. No matter what assumption the NAS makes, immigrants use more in public services than they pay in taxes. The largest net drain they report is $299 billion a year. It should be pointed out that native-born American are also shown to be a net fiscal drain, mainly because of the federal budget deficit — Washington gives out a lot more than it takes in. But the fiscal drain created by immigrants is disproportionately large relative to the size of their population. Equally important, a fiscal drain caused by natives may be unavoidable. Adding more immigrants who create a fiscal drain, on the other hand, can be avoided with a different immigration policy…. With regard to economics — jobs and wages — the results in the NAS study, based on the standard economic model, show that immigration does make the U.S economy larger by adding workers and population. But a larger economy is not necessarily a benefit to natives. The report estimates that the actual benefit to the native-born could be $54.2 billion a year — referred to as the “immigrant surplus.” This is the benefit that accrues to American businesses because immigration increases the supply of workers and reduces American wages. Several points need to be made about this estimate. First, to generate this surplus, immigration has to create a very large redistribution of income from workers to owners of capital. The model works this way: Immigration reduces the wages of natives in competition with immigrant workers by $493.9 billion annually, but it increases the income of businesses by $548.1 billion, for a net gain of $54.2 billion. Unfortunately, the NAS does not report this large income redistribution, though it provides all the information necessary to calculate it. A second key point about this economic gain is that, relative to the income of natives, the benefit is very small, representing a “0.31 percent overall increase in income” for native-born Americans. Third, the report also summarizes empirical studies that have tried to measure directly the impact of immigration on the wages of natives (the analysis above being based on economic theory rather than direct measurement). The size of the wage impact in those empirical studies is similar to that shown above. The NAS report cites over a dozen studies indicating that immigration does reduce wages primarily for the least-educated and poorest Americans. It must be pointed out, however, that there remains some debate among economists about immigration’s wage impact. The fourth and perhaps most important point about the “immigrant surplus” is that it is eaten up by the drain on the public fisc. For example, the average of all eight fiscal scenarios is a net drain (taxes minus services) of $83 billion a year at the present time, a good deal larger than the $54.2 billion immigrant surplus. There’s much more, but that’s enough for me. Build that wall! What’s the root of the problem? A certain, violence-prone racial minority, of course, and also under-incarceration. Follow all of the links in the preceding paragraph, and read and weep. The pseudo-libertarian camp is on the warpath about the war on drugs and a resulting rate of incarceration that seem “too high,” relative to the rates in other Western nations. That other Western nations have different distributions of ethnicity and age than the U.S. is beside the point when one’s objective is to pummel the American legal system for prosecuting victimless crimes … blah, blah, blah. Drug-use is as victimless as suicide, except that a fair proportion of drug users and dealers do, in fact, victimize innocent bystanders. Drugs, like alcohol, lower a person’s inhibitions — often with destructive results — and the cost of drugs is often financed by theft and related violence. Of course, non-drug-using taxpayers could be required to subsidize drug users. But I doubt that such a proposition would get very much legislative support. As for the criminal element, government restrictions would open the door to a black market, operated by the usual suspects. In the meantime, drug-users would continue to expose themselves to the same inhibition-loosing effects, and many of them would still resort to crime to underwrite their drug intake. of the two causal explanations [of a drop in the crime rate] that have found the most support, one—the economy—had nothing to do with crime policy. The other, the petering out of the crack epidemic, was simply a return to normal after weathering the effects of a bad policy. Once distributors of the new drug had established turf, levels of violence returned to normal. The only problem with Balko’s analysis is its incorrectness, which is driven (no doubt) by his pseudo-libertarian desire to castigate the government for prosecuting “victimless” crime. In truth, according to my quantitative analysis — done almost four years ago — there are three measurable and significant determinants of violent and property crime: the percentage of black in the population, the rate of real growth in GDP, and the incarceration rate. (The fact that the analysis was done before the Great Recession counts in its favor, inasmuch that event would distort the relationship between crime and economic growth.) What follows are some key portions of the post that documents my earlier analysis. Key: VIC, violent crimes per 100,000 persons; VPC, violent+property+crimes per 100,000 persons; BLK, blacks as a proportion of population; ENL (active-duty, male, enlisted personnel as a proportion of population aged 15-24; GRO(C), growth of real GDP per capita as a proxy for year-to-year growth (GRO) used in the regression analysis; PRS, prisoners in federal and State penitentiaries as a proportion of population; SNT, mandatory sentencing guidelines in effect (0 = no, 1 = yes); YNG, persons aged 15-24 as a proportion of population. A few comments about each of the explanatory variables: BLK, unfortunately, stands for a segment of the population that has more than its share of criminals — and victims. Having more men in the armed forces (ENL) should reduce, to some extent, the number of crime-prone men in the civilian population…. I use the annual rate of real, per-capita economic growth (GRO) to capture the rate of employment — or unemployment — and the return on employment, namely, income. (The use of year-over-year growth vice cumulative growthavoids collinearity with the other variables.) PRS encompasses not only the effects of taking criminals off the streets, but the means by which that is done: (a) government spending on criminal justice and (b) juries’ and courts’ willingness to put criminals behind bars and keep them there for a good while. SNT ensures that convicted criminals are put away for a good while. I focused on violent-plus-property crime (VPC) as the dependent variable, for two reasons. First, there is a lot more property crime than violent crime (VIC); that is, VPC is a truer measure of the degree to which crime affects Americans. Second, exploratory regression runs on VPC yielded more robust results than those on VIC. Even at that, it is not easy to tease meaningful regressions from the data, given high correlations among several of the variables (e.g., mandatory sentencing guidelines and prison population, number of blacks and prison population, male enlistees and number of blacks). The set of six explanatory variables — taken one, two, three, four, five, and six at a time — can be used to construct 63 different equations. I estimated all 63, and rejected all of those that returned coefficients with counterintuitive signs (e.g., negative on BLK, positive on GRO). Even though the coefficient on GRO isn’t strongly significant, it isn’t negligible, and the sign is right — as are the signs on BLK and PRS. The sign on the intercept is counterintuitive — the baseline rate of crime could not be negative. The negative sign indicates the omission of key variables. But forcing variables into a regression causes some of them to have counterintuitive signs when they are highly correlated with other, included variables. 1. Crime can be reduced if economic growth is encouraged by rolling back tax rates. 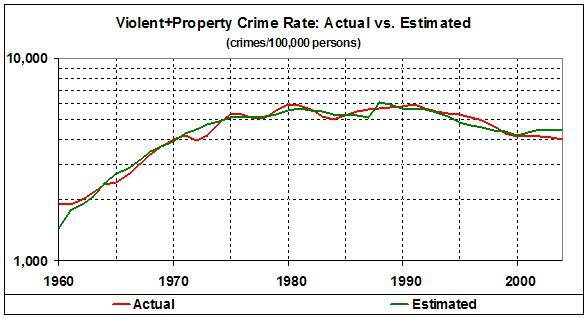 Crime will rise if growth is inhibited by raising tax rates (even for the very rich). 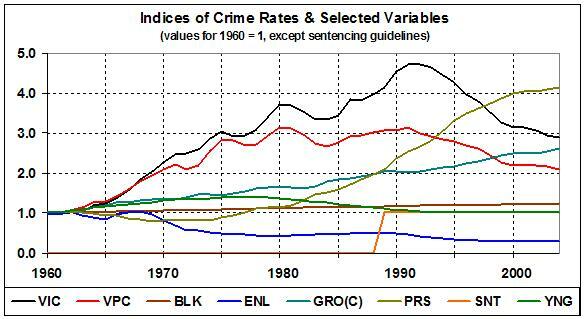 ENL and YNG, like SNT, are key determinants of the crime rate. Each of the three variables appears, with the right sign, in many of the 63 equations. So, I am certainly not ruling out ENL and YNG as important variables. To the contrary, they are important variables. But, just as with SNT, I can’t satisfactorily quantify their importance because of the limitations of regression analysis. Crime, then, depends mainly on two uncontrollable variables (BLK and YNG), and four controllable ones: ENL, GRO, PRS, and SNT. The controllable variables are salutary means of reducing crime, and the record shows that they work. Whatever else abortion is, it is not a crime-fighting tool; those who herald abortion as such are flirting with genocide.